Launching your US career with a platinum-selling single isn't a bad look. And that's exactly what Tinie Tempah has done with Written In The Stars. His US debut peaked at number 12, setting up Plumstead's second-finest export (after Shampoo) for a big year Stateside. However, rather than follow up Written In The Stars with proven hits like Pass Out or Frisky, Tinie has recorded an entirely new song with Wiz Khalifa. "I respect his hustle," he told Rolling Stone, somewhat mystifyingly. "I feel like we're in the same kind of situation, but in reverse. He's really huge out here now and I have a lot of presence in the Europe and UK, and vice versa, so if there was ever a time to collaborate, now would be the time." The song is called Till I'm Gone and it's produced by Rihanna cohorts Stargate. Built around a single ascending synth riff, it's a little formulaic - playing it safe for US radio's notoriously risk-averse radio programmers - but Tinie still squeezes in a few deft lyrical touches. My personal favourite is: "I shook hands with royalty / I make songs that monarchs know" (it's all in the delivery). Here's the promo, which employs rap video template 4(b). look out for the random shot of a blonde extra who the director has taken a shine to at 2'03". 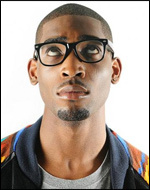 Tinie supports Prince at the Hop Farm festival on Sunday... I can't wait!